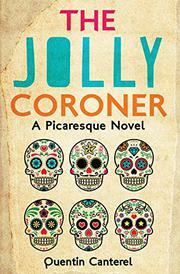 Debut author Canterel offers a surreal novel about an unlikely coroner. Welcome to the city of Hokum. Although it’s ostensibly modern, in parts, it’s also a place “dotted with the typical gothic horrors and irredeemable folklore of many small southern cities.” It’s subsumed by invasive kudzu and a population of Mexican workers from “the nearby alfalfa plantations.” The city’s coroner, a philosophical, heavyset, hard-drinking man named Billy Rubino, is an antihero if there ever was one. As he investigates the possible murder of a man at a local motel that’s known for gay hookups (where “The hallways rang with deep moans of ecstasy at all hours of the day or night”), he finds himself at odds with his colleagues. They insist that he rule out foul play to simplify the case, but he feels uneasy about such a hasty conclusion. Meanwhile, a Polish man named Basyli, who’s erroneously been declared dead due to an identification mix-up, pleads with Billy for help to escape his state of nonexistence. The book’s drug use, obscure classical music references, and assortment of local weirdos depict Hokum as alternately surreal and vulgar (“you could no longer walk under a bridge downtown without the fetor of human urine”). The story is part David Lynch, part comedy of errors, and readers will never quite know what will happen next. The scenes are loaded with surprises; however, they tend to overflow with excessive detail, which may frustrate some readers. Little is left to the imagination, allowing for vivid, if overdrawn, descriptions of such things as teeth and hands (“coriaceous hands resembled gorilla’s paws”). Nevertheless, as the plot becomes stranger, the fate of Billy and the town he serves remain very much up for grabs. A highly creative, if meandering, adventure.